The Peace Hotel in Shanghai comprises two buildings on the Bund separated by the bustling Nanjing Road (南京路). The one to the south was built in 1908 and was where Sun Yat-sun once stayed during the Xinhai Revolution. It is now the Swatch Art Peace Hotel. The building to the north, the prettier of the two with the signature copper pyramid top, was built in the 1920s during the Jazz Age. 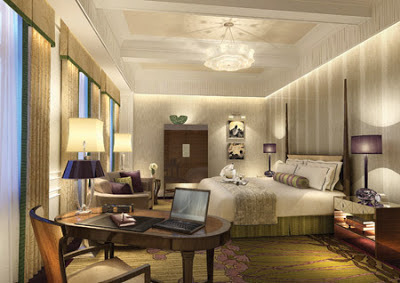 It is now the five-star Fairmont Peace Hotel. You may think that the Peace Hotel was so named because some important peace treaty was signed there. Not so. The twin buildings didn't carry their current name until the 1950s when the Shanghai government took over the premises. It isn't clear where the name actually came from. In 2007, the Fairmont Group began renovating the north tower and relaunched it as the Fairmont Peace Hotel three years later. A new wing was added while most of the original art deco architecture was kept intact. Restored to its former splendor, the grand lobby and the famous Jazz Bar will transport you back in time to the heyday of Shanghai, a time when jazz music and ballroom dancing lasted all night, when Jay Gatsby and Jake Barnes schmoozed with their party-going friends over a highball. Today, you will more likely run into local tour groups coming and going in droves. Between all the loud talking and camera flashing, peace is in short supply at the Peace Hotel. The rooms at the newly-renovated hotel are good-sized and furnished in art deco style. A handsome writing table and a generous crescent sofa sit atop lush designer carpeting opposite a super-king poster bed. Each room is fitted with an Illy coffee machine in a well-appointed foyer area that doubles as a mini-bar. The marbled bathroom features a claw-foot tub flanked by a vanity and sink console on each side. As is the case for many luxury hotels in China, the hardware at the Fairmont Peace Hotel is far better than the software. And by software I mean the people who work there. Many of the hotel staff look confused and act confused. The hotel manager I dealt with was abrupt and at times rude, which is upsetting and, considering the amount of effort the Fairmont Group poured into the project, also unfortunate. Hospitality is a tricky business. Hotel operators can’t buy a new staff like they do furniture and coffee machines and expect them to hit the ground running on Day One. It will be years before the customer service industry in China finally gets it right. With new hotels popping up in Shanghai on a monthly basis, the Fairmont Peace Hotel faces stiff competition. For roughly the same price, you will find more peace and quiet as well as superior service at either the Peninsula a short walk away or the Waldorf-Astoria on the other end of the Bund. What it needs is a rooftop bar overlooking the Bund, the river, and Pudong. When I looked it, the only bar was in the lobby. Indeed, the Jazz Bar is on the ground floor by the check-in counters. There is Cin Cin on the mezzanine level. The Cathay Room overlooks the river but it's a restaurant.